Below are listed reviews of solar installers in the SolarQuotes network who serve Australia’s finest city: Adelaide, in South Australia. To get free quotes from 3 of these reputable Adelaide installers, simply input your postcode in the box at the top and press the big red button. All the information you need to know about installing solar panels in Adelaide is below the table. Adelaide has a Mediterranean climate. Summers are hot with an average high of 29.4° in February and winters are cold with an average low of 7.5° in July. After Perth and Brisbane, Adelaide is Australia’s third sunniest state capital and solar panels on a typical north facing roof will receive an average amount of sunlight energy equal to 5.0 hours of full noon sunshine a day. A good quality 5 kilowatt solar system installed on a north facing roof in Adelaide could generate an average of around 20 kilowatt-hours a day; or 7,300 kilowatt-hours of electricity annually. The angle of your roof is likely the best angle to install solar panels in Adelaide. The reason for this is while you can use frames to provide what would be considered the optimum angle, the cost and complication simply isn’t worth it in most circumstances – and often special permission will need to be gained from your local Council to use frames. Bear in mind there is very little difference in output over a year between a shallow 15 degree roof and a steep 45 degree roof. While shallow roofs offer a small advantage to households with high summer air conditioning demand, steeper rooftops provide a mild advantage to those who consumer more power during winter. A 45 degree roof will generate around 9% less electricity in January and 20% more in July. North facing solar panels will generate the most electricity in Adelaide, but installing solar modules with an east or west orientation is worth considering if this will increase the household’s consumption of solar electricity. Panels oriented east or west in Adelaide will generate almost 20% less electricity than north facing panels over the period of a year. East facing solar panels maximise electricity generation in the morning, while west facing modules produce more in the afternoon. East will have an edge over west as mornings are cooler – heat reduces the conversion efficiency of solar panels. Panels facing north-east or north-west will generate approximately about 5% less electricity than north facing panels. This table shows you how a combination of roof direction and tilt will affect your solar power output in Adelaide. It indicates the energy yield for your chosen orientation relative to the optimum orientation for Adelaide; which is north facing and 35 degrees. Adelaide households can install up to 5 kilowatts if they have single phase power or 30 kilowatts if they have 3 phase power. If you wish to install a system size greater than 10kW, Council permission will be required. These maximums are determined by inverter size, not the total capacity of the solar panels, so Adelaide households can install solar panels with a total capacity greater than the size of their inverter if they wish – this is called oversizing and is a quite common practice these days. They can also install an inverter larger than 5kW, if it is export limited to 5kW. Ten kilowatts of solar panels is a big system requiring a large amount of roof space for installation – 50 square metres. 5-6 kilowatts should be plenty for most households. In South Australia the connection of homes and businesses to the grid is managed by SA Power Networks. They have produced a brochure that outlines the application process for installing rooftop solar power systems. While they recommend contacting SA Power Networks as a first step, in practice you can contact a solar installer first and they are likely to be glad to guide you through the process. Adelaide City Council’s Sustainable City Incentives Scheme offers a rebate of 20% for installation of solar panels installed in the Central Business District and North Adelaide. In addition, energy storage systems in that area connected to rooftop solar power are eligible for a rebate of 50% of the installed cost up to a maximum of $5,000. Households in Adelaide use less electricity than any other capital city in Australia with an average consumption of around 6,080 kilowatt-hours a year for a 3 person household that doesn’t use gas. Residential electricity use averages 20% higher in winter than summer. South Australia has the highest retail electricity prices of any Australian state. Including GST grid electricity averages around 30 cents a kilowatt-hour with a typical daily supply charge of 70 cents. An Adelaide household without solar power that uses 6,080 kilowatt-hours and has a plan that gives them a 10% discount would pay around $1,870 a year. Costs vary plan to plan and it’s a wise idea to compare what each electricity retailer is offering. 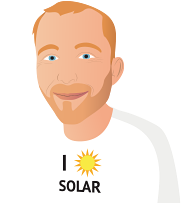 You can compare electricity retailer plans including solar feed in tariff information using SolarQuotes’ electricity price comparison tool. With the tool, you can enter you bill details and it will estimate how much various retailers would have charged for the same usage; plus provides current information on the feed-in tariffs they offer. An Adelaide family that installs three kilowatts of north facing rooftop solar power and self consumes half of the electricity it produces, with an 8 cent feed-in tariff, and a plan that gives them a 10% discount can expect to reduce their electricity bills by around $770 a year. All else equal, with a 12 cent feed-in tariff a household could expect to save around $850. Because the feed-in tariff households receive for sending excess solar electricity into the grid is much less than the cost of buying electricity from the mains grid, maximizing solar electricity self consumption boosts the economic benefit of a rooftop solar installation. While this is a far easier task for people who spend the day at home, even those who aren’t at home for much of the day can maximise self consumption of solar electricity by setting appliances such as dishwashers, hot water systems, and pool pumps to operate during the day. Additionally, setting an air conditioner to cool the house during the day before arriving home on summer evenings can also be very useful. High air conditioner use on hot summer afternoons and heating on cold winter mornings mean an east-west split of rooftop solar panels can be a very good way for many Adelaide households to increase self consumption of solar electricity. Adelaide’s southerly location combined with daylight savings means the sun doesn’t set until 8:30 pm or later for over 4 weeks in the middle of summer, which is useful for powering air conditioners in the late afternoon with solar electricity, especially when using west or north-west facing solar panels. Adelaide’s leafy suburbs such as Wayville have many established old trees and the highest chance of roofs that suffer from shading, especially in winter when shadows are longer. The use of microinverters or DC optimisers can assist in minimising the loss of solar output attributed to shading. Because Adelaide’s air tends to be dustier than most state capitals’ and the summers are often low in rainfall, cleaning panels may result in a slightly higher increase in output than in most cities. Households and businesses in Adelaide can benefit from rooftop solar installations where the solar panels have a collective capacity greater than that of their inverter – this is called oversizing. While this will result in some reduction of output from the solar panels when the sky is clear and the sun is high in the sky, greater output will be achieved when the sun is low or in situations of overcast skies. This translates to smoother production of solar electricity through the day; with the potential for increasing self consumption and subsequently improving the payback period of a rooftop solar power installation. A rooftop solar system’;s total panel capacity can be up to thirty-three percent more than the rated capacity of its inverter or inverters and still receive the full number of STCs as part of the solar rebate. 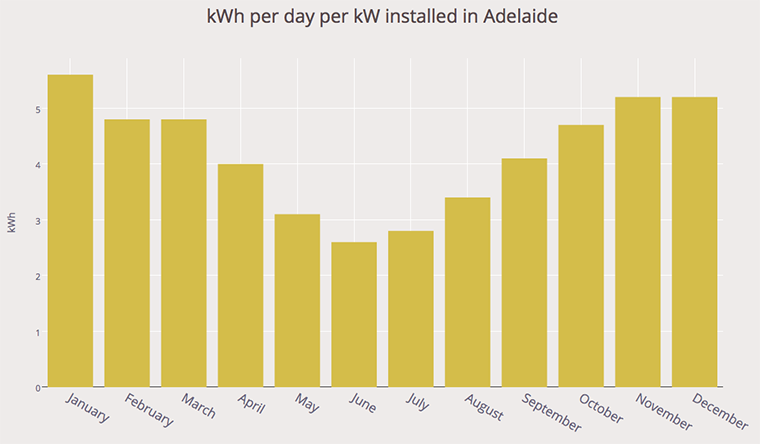 STCs can reduce the up-front cost of going solar in Adelaide by thousands of dollars. The current solar rebate will be reduced on the first of January each year until it ends in 2030, so the earlier a system is installed, the greater the subsidy available – however, the value of STC’s are also subject to market forces. A suitable import/export electricity meter will also need to be installed along with the solar power system, which will need to be carried out by your electricity retailer. South Australia has over 764 megawatts of rooftop solar in over 211,700 installations which are mostly found in and around Adelaide. Currently, South Australia is second in the nation for the number of installations per person. Rooftop solar power systems provide approximately 8% of the state’s total electricity consumption and at times of high sunshine and low demand has provided up to 48% electricity use. Within the next decade, rooftop solar panels are expected to meet all demand at times. South Australia has the lowest greenhouse gas emissions per person of any mainland state. Coal power has been eliminated and it is the state with the most wind power capacity. Wind power and rooftop solar panels generate electricity equal to more than 50% of the state’s consumption. Electricity produced by new rooftop solar installations in Adelaide will mostly displace electricity generated by natural gas. Because gas power stations produce less carbon dioxide and other dangerous emissions than coal power stations, new rooftop solar power is likely to be of less immediate environmental benefit than in other mainland states. However, because South Australia often imports electricity generated by extremely CO2 intensive brown coal power stations in Victoria, new rooftop solar power will also cut coal use in addition to natural gas. South Australia also occasionally exports electricity to Victoria during the day which cuts their coal use. As South Australia’s rooftop solar capacity grows, more electricity will be exported to Victoria during the day and so the environmental benefit of rooftop solar installations in South Australia is likely to increase over time. Power stations in South Australia are privately owned. High voltage, long distance transmission is managed by ElectraNet and the low voltage distribution of electricity to homes and businesses is handled by SA Power Networks. Due to a lack of suitable timber, South Australia uses 720,000 steel and concrete stobie poles to support 200,000 kilometers of power lines. The electricity grid serves 850,000 households and businesses and covers 178,000 square kilometers which is 18% of the state.